Offers full service banking in Sevierville, Tennessee. Provides banking and investment services in Sevierville, Gatlinburg, and Pigeon Forge. Specializing in wedding and outdoor portraits. Includes information about packages, prices and policies. Located in Sevierville. Gary Woods Photography of Sevierville, TN. Commercial, family, wedding, children and high school portraits and photography. USS Club in the Southeastern Swimming LSC in Sevierville TN. Includes Programs, Meet and Practice Schedules, Coaches, Calendar, Directions, and Fundraising information. Rates, policies, course map, and lodging. Sevierville. Urology practice with offices in Knoxville and Sevierville. Information about the physicians and services offered. Guiding ATV trail rides in the Smoky Mountains. Offices in Pigeon Forge and Sevierville. Provides an outdoor field in Sevierville. Includes rules, hours, directions, prices, and photos. Produces dry, semi-sweet and dessert fruit wines. Located in Sevierville in East Tennessee. Offers balloon rides in Sevierville. Includes FAQ, pricing, maps, and other information. Offers balloon rides originating from Sevierville. Includes FAQ, package descriptions and prices, location map, and other information. Offering guided interpretive walking tours and hiking in the Great Smoky Mountains National Park. Includes pricing, reservation and contact information. Located in Sevierville, Tennessee. Indoor range in Sevierville, Tennessee. Classes and merchandise offered. Sevierville, Tennessee firm offering services nationwide. Includes information on services, billing, employment opportunities and how to contact. A full service year round campground. Deluxe cabin and mobile home rentals. Full hook ups, General store, pool, laundry, river fishing and Church service on site. Located in Sevierville. Services and Sunday school, history, staff and contact, ministry, calendar, play a hymn, photos, thought, location and links. A ministry in Sevierville, Tennessee that educations people in biblical truth and theology. Audio presentations, schedule for studies and events, contact information, and study topics. Ancestors of Jimmy Chase Webb as compiled by Diana Hope Webb from Sevierville, TN USA. Includes the descendants of Foster Dean Webb, Edward Francis and Millard Mann. Premium facilities, service and presentation of first run motion pictures. 360Ãƒâ€šÃ‚Âº digital surround sound, wall-to-wall screens, & spacious seating. Serving Sevierville. event held in sevierville, tennessee. headlined by traditional and contemporary bluegrass artists. photos, festival information, camping reservations, directions and artist links. SiteBook Sevierville City Portrait of Sevierville in Tennessee. 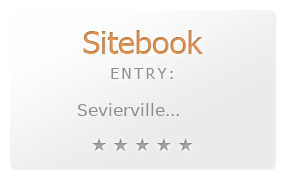 This Topic site Sevierville got a rating of 4 SiteBook.org Points according to the views of this profile site.